Spoga Horse 2019: How Do Equestrian Athletes shop? Cologne (GER), January 30, 2019 - The digitalisation is a key future theme for the trade. This also applies for small, specialised industries, such as the equestrian sport trade. When equestrian sport athletes buy new equipment for their hobby, they too increasingly do so online. This is deduced from the current BSI consumer survey entitled "Megatrend digitalisation - how do the equestrian athletes shop?" carried out by the Hamburg-based market research company, benchex, on behalf of the Equestrian Sport Specialised Group of the German Association of the Sports Goods Industry e.V. (BSI). 40 percent of all newly purchased equestrian sport items are sourced today via the Internet shop of an equestrian sport chain store, from the website of a manufacturer or other online channels. This offers the trade the opportunity to tap into buyer groups outside of their own region. Expanding their segments offers the specialised trade further opportunities: 54 percent of horse owners also own at least one dog and thus have increased interest in offers for dogs. This is concluded from a potential analysis that was carried out by the market research and consulting company, HorseFuturePanel, on behalf of spoga horse. The results of both surveys will be presented and discussed with the trade in the scope of several presentations at the International Trade Fair for Equestrian Sports, spoga horse spring 2019 (2 to 4 February 2019 in Cologne). According to the BSI equestrian sport survey, 60 percent of the equestrian sport items will continue to be sold to the riders via the bricks and mortar trade. The preferred points of purchase of the respondents are the subsidiaries of an equestrian sport chain store, specialised equestrian sport shops as well as equestrian shows and consumer fairs. The preference of the customers for either of the two purchase channels also depends on the product group: The survey results show for instance that horse blankets and riding garments (jodhpurs/tops) are much more frequently purchased online than riding boots or saddles, where following experience the equestrian athletes place particular value on individual consultations on-site and the right fit. "The high share of the online trade compared to total sales shows how important it also is in the equestrian sport industry to adapt one's marketing strategy to the megatrend digitalisation. Many manufacturers and dealers have already successfully positioned themselves in the online business - others are still in the starting blocks", said Monique van Dooren-Westerdaal, member of the board of the BSI and Chairwoman of the BSI Equestrian Sport Specialised Group. An assessment that is also reflected in the results of the surveys: Equestrian sport chains that traditionally have a bricks and mortar trade background record a share of twelve percent of all newly sold equestrian sport items with their additional online shops. This means they lie in first place, ahead of purely online dealers, who attain a share of seven percent. Together the bulk of the independent stationary specialised dealers on the other hand only achieve a share of four percent. "There is without doubt unexploited potential here. Setting up an Internet shop can definitely offer specialised equestrian sport dealers the opportunity to attract new buying groups outside of their own region", said Christoph Krauss, Executive Director of benchex, is convinced. They can above all win over customers if they bank on individuality in terms of the services offered and their customer address. Noticeable: The Internet giant, Amazon, only holds a very small market share of two percent. Specialised dealers can above all achieve an individual customer address if they know their customers and their interests. Hitherto these extend beyond the equestrian sport, because according to the potential analysis of HorseFuturePanel, 54 percent of all horse owners also own at least one dog. This opens up a new target group for the suppliers of equestrian sport items. "Until now dogs items have only accounted for a small share within the equestrian sport business, however they are gaining in significance. The dealers are thus on the right track towards satisfying their customer's requirements. Because 37 percent of the horse owners interviewed who own a dog, would find it good if they could buy all of the products for horses and dogs from the same shop (stationary or online)", was the comment of Catja Caspary, Vice President of Koelnmesse GmbH regarding the results. In addition to the everyday supplies such as dog food, 76 percent of the dog owners also purchase toys for dogs several times a year and are among others animated to do so by a positive buying incentive. They primarily purchase new products, when the old item wears out. 75 percent of the respondents cited this as the main reason for a purchase. 62 percent stated as a further reason, not owning the item yet. In addition to the demand-oriented purchasing decisions, spontaneous purchases also occur, where the item directly appealed to the buyer. 44 percent stated that this was also one of the main reasons. This offers the suppliers of dogs items the chance to arouse the interest in individual items by presenting the goods in an attractive way and thus increase the sales of the products. The results of the BSI equestrian sport survey provide an insight into the preferences of a young, female and educated target group. 98 percent of the 1,040 respondents across Germany are female. The average age is 32. The level of education of the random sample is high: 70 percent of the survey participants have either obtained a 6th form school leaving certificate or higher qualifications. The results of the potential analysis of HorseFuturePanel originate from a very similar target group: of the 965 interviewees across Germany, 90 percent are female. The average age is 42. 88 percent of the respondents are employed. Further exciting cognitions regarding the individual product groups, buying decision procedures and the information behaviour of the equestrian athletes can be deduced from the BSI equestrian sport survey and the potential analysis of HorseFuturePanel. The BSI Equestrian Sport Specialised Group and HorseFuturePanel will present and discussed these with the trade in the scope of several presentations at the equestrian sport trade fair, spoga horse spring 2019 (2 to 4 February 2019 in Cologne). The survey "Megatrend Digitalisation - how do equestrian sport athletes shop?" was carried out between January and March 2018 by the Hamburg-based market research company, benchex GmbH, using an online questionnaire. It was commissioned by the Equestrian Sport Specialised Group of the German Association of the Sports Goods Industry e.V. People aged over 16, who had purchased at least one equestrian sport item over the past 24 months, were eligible to take part. The consumer behaviour was enquired about across thirteen product groups in total. Second-hand purchases, which is how a certain share of equestrian sport items change hands, were not included in the survey. 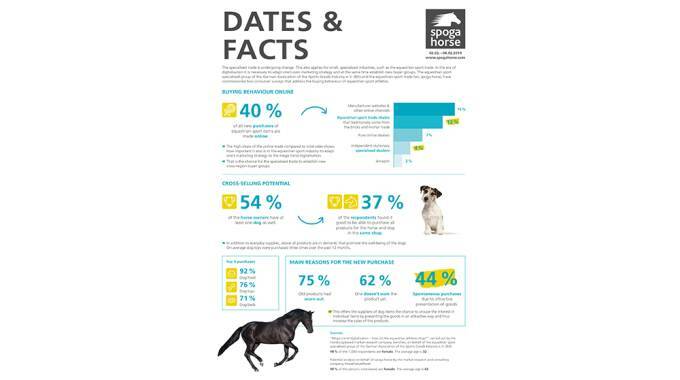 This is concluded from the "Potential analysis on the market for products for dogs and horses" that was carried out in June and July 2018 by the market research and consulting company, HorseFuturePanel, on behalf of spoga horse via an online survey. The interviewees were people over the age of 14, who actively participate or participated in the equestrian sport and/or own a horse. The survey enquired about the interviewees' relationship to dogs as well as their information gathering and buying behaviour for items for the horse and/or dog".